Mahakala is an emanation of Avalokiteshvara in his wrathful form. He appears as Mahakala to defeat the delusions of ignorance, anger, and attachment. Mahakala is a wrathful dharma protector for the Mahayana practitioner. Mahākāla is a Sanskrit bahuvrihi of mahā"great" and kāla "Black". 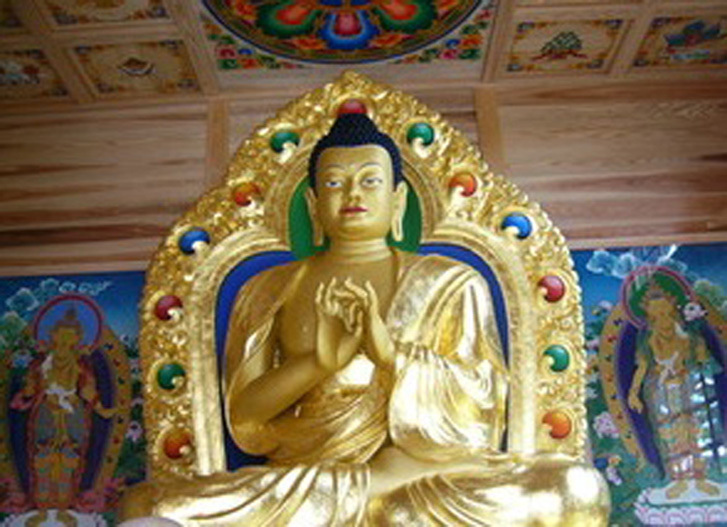 Mahākāla is relied upon in all schools of Tibetan Buddhism. The Mahakala workshop was taught by Mr. Oshoe at Land of Enlightened Wisdom center in Pomona, CA on December 10-11, 2011. Students interested in dharma and art attended the workshop, learning to make the mask of Mahakala with the guidance and understanding on teacher-artist Mr. Oshoe. Mr. Oshoe has been commissioned to create Buddhist sculptures internationally in Japan, Europe and the United States. In June of 2011, he completed a three year project, with a team of artists working to create the 25 ft statue of Buddha Shakyamuni at a Japanese monastery. Mr Oshoe spent 3 months at the Pomona, CA center sculpting and bringing to life the Arya Tara Statue, which he completed in December 2011. You can view Mr Oshoe's Thangka painting, shown at the Johnson Museum of Art.